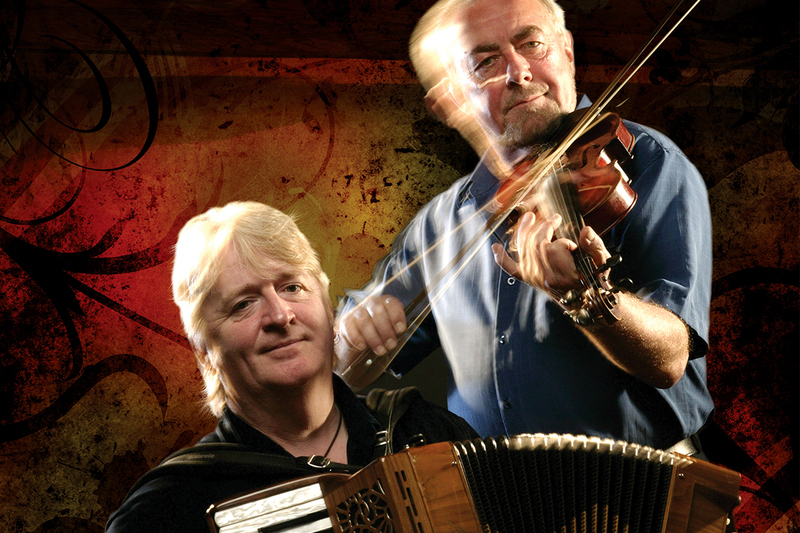 Two of the best traditional musicians return to Theatr Mwldan on Tuesday 4 April at 7.30pm, having toured together since 1986 to packed concert halls all over the world. The duo recorded their first album ‘The Pearl’ in 1994 and followed it with many more highly acclaimed albums including ‘Five and Twenty’ CD to celebrate their 25th Anniversary. They also have two ‘Best of’ collections released of their work. Aly was a founder member of the ‘Boys of the Lough’ and his passionate fiddle playing has also found its way onto recordings by the likes of Eddi Reader and Richard Thompson. He was responsible for launching ‘The Transatlantic Sessions’ TV series in which both he and Phil continue to feature. Accordion player Phil has been named as one of Scotland’s 25 most influential people and his mastery of the instrument has led to him working with the likes of Mark Knopfler, James Taylor, Rosanne Cash and Midge Ure. Together they are simply the best traditional musicians you are ever likely to hear. Alyn Bain is the best known and most significant fiddle player in the Celtic tradition. He is rightly regarded as Scotland’s supreme fiddler- arguably the finest of all time. Aly has toured extensively in America, Europe and the UK. In 1994 he was awarded an MBE in recognition of his services to music and in 1999, received the degree of Doctor of Music from the Royal Scottish Academy of Music and Drama. In 2013 he received a Lifetime Achievement Award at the BBC Radio 2 Folk Awards. Phil Cunningham is a world famous accordion player and composer. In recent years Phil’s work load has included numerous commissions for TV and film and an increasing amount of work as musical director for television and theatrical events. His ‘Highlands and Islands Suite’ and other collaborations have been a highlight of Celtic Connections in Glasgow. In 2002 Phil received an MBE for his contribution to Scottish music. His musical documentaries are regularly seen on TV screens invariably involving his passion for the accordion. Tickets to see Aly and Phil perform are £16 (£15) and can be booked online or via mobile by visiting www.mwldan.co.uk, or directly with Mwldan’s box office 01239 621 200.